1984 was a fantastic year for GIJoe! In purchasing a single “figure pack” from the Sears Wishbook, my parents managed to exponentially increase the size of my fledgling Cobra army by adding Baroness, Firefly, Scrap-Iron, and Storm Shadow to the ranks. However, it was a small wrapped package that featured an odd vehicle and driver that grabbed my young attention and firmly captured my imagination. Inside was a figure who debuted in “GIJoe: The Revenge of Cobra” by organizing a prison break from Blackwater Prison and returned Cobra Commander back to the sunken temple. Zartan was a bit of “riddle wrapped in an enigma” and both his characterization in the Sunbow animated series as well as Larry Hama’s excellent comic portrayal quickly made him one of my all-time favorite allies of Cobra. 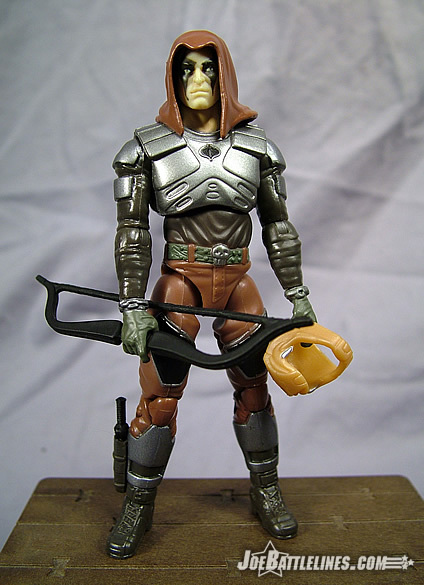 Now, over two decades later, Zartan is released in the anniversary line with a bit of an update, as well as homage to his debut appearance. 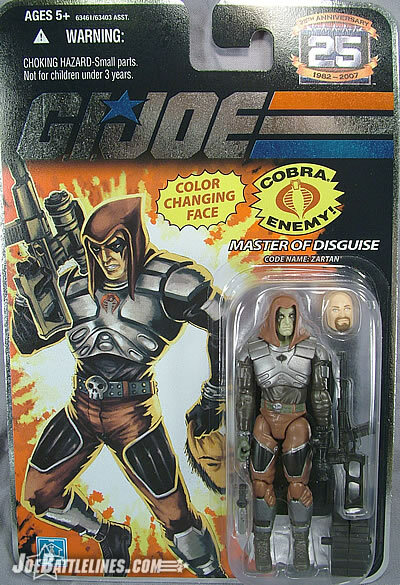 Does this “new/old” look work for Cobra’s premiere disguise artist? Read on, and find out one Joe fan’s opinion. As with most of the figures in the 25A line, Zartan is primarily homage to the original character design released back in the 1980’s. However, unlike some of his peers, Zartan’s uniform deviates somewhat from the original and this has caused mixed reactions from many fans. He’s still wearing the rust brown pants with the padded panels and he’s still wearing the silver armored half-shirt with the panels that also protect his shoulders. He’s even got the “armored” boots worn by the original figure. However there are a few slight differences: the panels on his pants are no longer removable nor do they feature any type of “color changing” action. The boots are no longer rendered in a single color but rather are painted in two tones—the armored sections are painted a dark silver while the boot underneath is a dark brown. The sheathed knife once molded on his right boot is now fully removable from the holster. 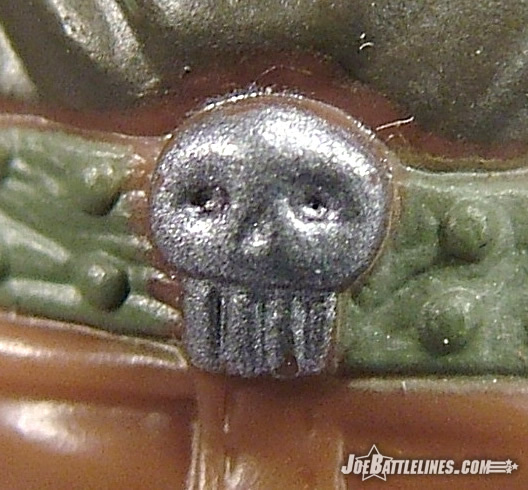 Zartan’s gloves are now cuffed with a small section of chain on the seam and his belt buckle features a painted silver skull. The final change to his classic uniform is found in a small Cobra sigil painted just under the neckline of his armored half-shirt. So far this is a terrific update to the original character design that still managed to retain all of the signature elements that made Zartan so distinctive. The change that seems to have many fans “up in arms” is that Zartan is actually depicted wearing a long-sleeved charcoal gray shirt under the armored top, covering up all the “skin” that had been exposed in the original release. Many fans have taken umbrage at this change—stating that it “ruins the character” and that it shouldn’t have been changed. Personally, I like the inclusion of the undershirt as I never really understood why someone like Zartan would run around in a metal crop-top in the first place. I understand that the original figure had all of the exposed “skin” in order to maximize the effect of the “color-changing action” when placed in the sunlight and that was fine for the 80’s. Heck, even Rocky Balboa was sporting a crop top when he trained on the beach with Apollo Creed in Rocky 3. However, times have changed and a man in a cowl with a crop top just wouldn’t have the same appeal now that it might have in the 80’s. Without the color changing skin featured in the original, I’m all for the inclusion of the dark shirt which seems only logical for someone who can be as affected by ultraviolet radiation as Zartan. The shirt gives Zartan a darker tone overall—adding a bit more of a sense of mystery and danger to the character. So, while some fans find this figure “less than good”, I’m not one of them. 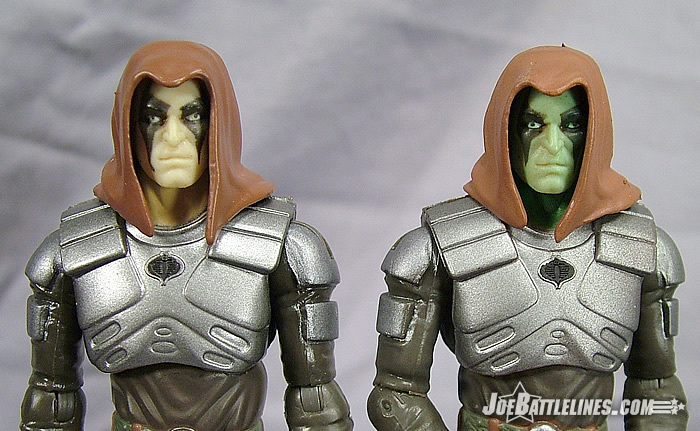 I’ve never been happy with most of the head sculpts used for Zartan over the years. The original was good for the time but subsequent releases failed to capture what I felt was the real look of Zartan as depicted in both the comic and the cartoon. (Let’s not talk about the Valor vs. Venom “hockey night” version—ever.) 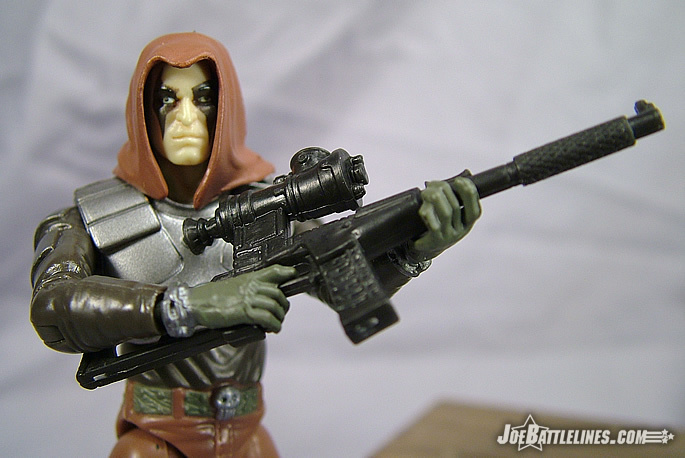 This figure, however, seems to nail the classic Zartan look in a way that even the fantastic Comic Pack #74 version can’t quite match. 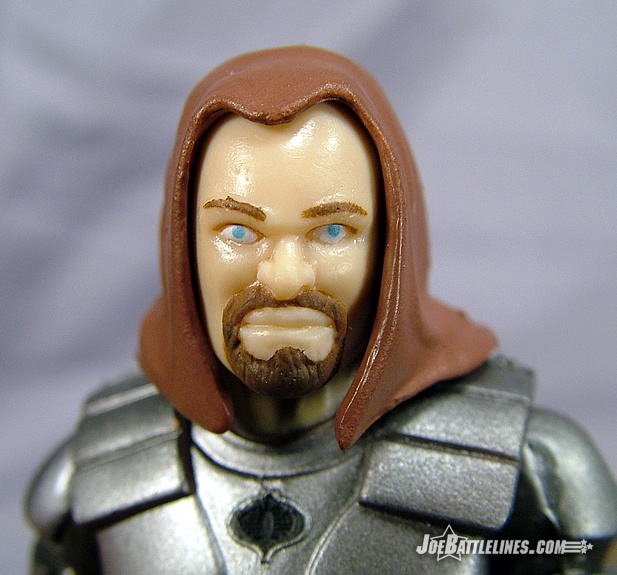 Zartan’s features are slightly oval-shaped with a long nose and a slightly protruding jaw line. His eyes are evenly set which gives him an air of intelligence, while the jaw line hints at a sense of disdain for those around him. (You’d have that look too if you spent most of your time with Torch, Ripper, and Buzzer!) The familiar facial makings are rendered perfectly around the eyes, with triangular protrusions extending both above and below the eye sockets. His “KISS” makeup is neither too large nor too small but fits his face perfectly. 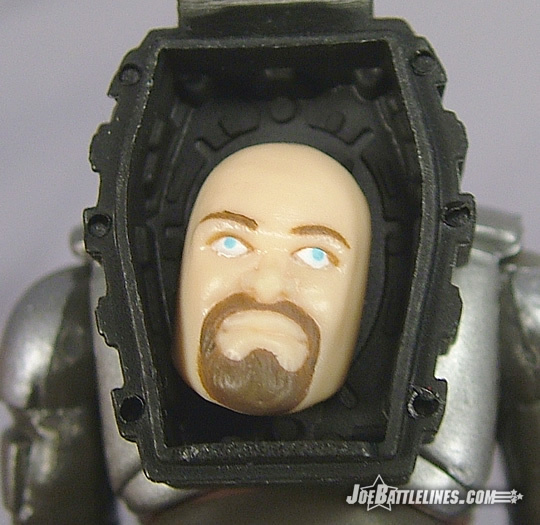 The entire head is then covered in a sculpted hood that sits completely naturally over his cranium. 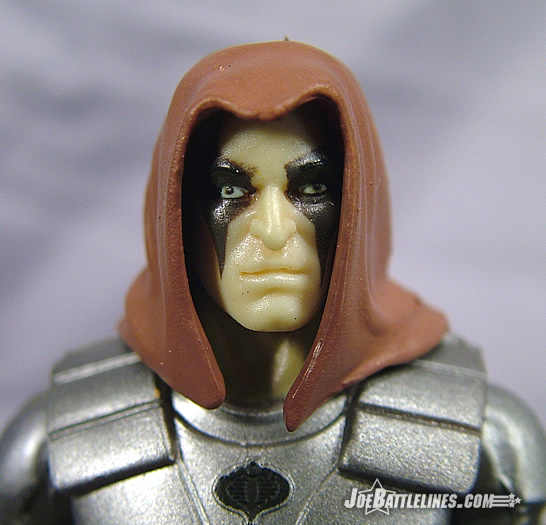 In fact, the cowl is so well designed that it is the aspect of this design that truly “seals the deal” for me and makes this Zartan! I have ZERO complaints about the design of the head and can declare it my favorite Zartan head sculpt to date. One interesting feature of this head sculpt is the inclusion of a “color changing” feature. (It’s since been revealed that not all versions of this figure feature the color-changing action but the ones that I’ve seen at stores have all listed this feature on the card artwork.) 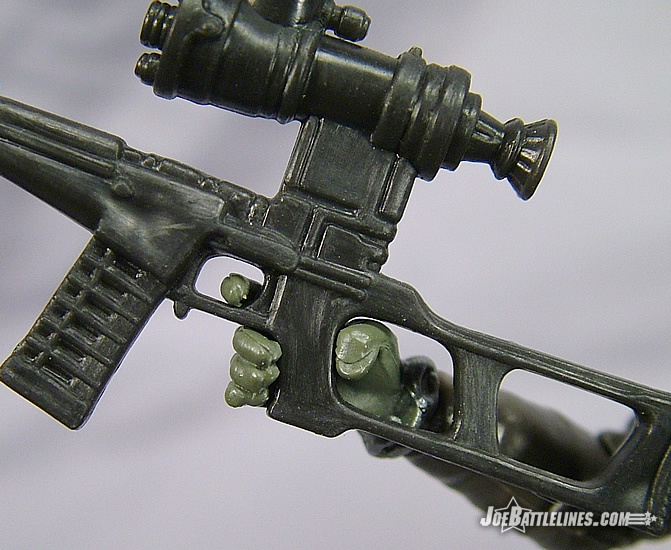 Rather than placing this figure in sunlight to activate the “greenish change”, Zartan seems to be thermo-chromatic. In other words, place Zartan in the freezer and his face and neck turn green. Once he returns to (at least) room temperature, his skin returns to its normal hue. The downside of this feature is that, at room temperature, Zartan’s skin is always slightly greenish in nature. I haven’t found this to be that much of an issue but I know that some fans have found this to be a bit distracting. When it comes to gear, Zartan travels with a “mixed bag of tricks”. He’s got a small knife to fit into the sheath on his boot, a sniper rifle with a starlight scope, and a familiar-looking backpack. This latter piece of equipment is an homage to the accessories of the original Zartan and opens to accommodate a small bearded mask which fits under the edges of his cowl. Just like the original figure, Zartan is complete with his disguise kit! 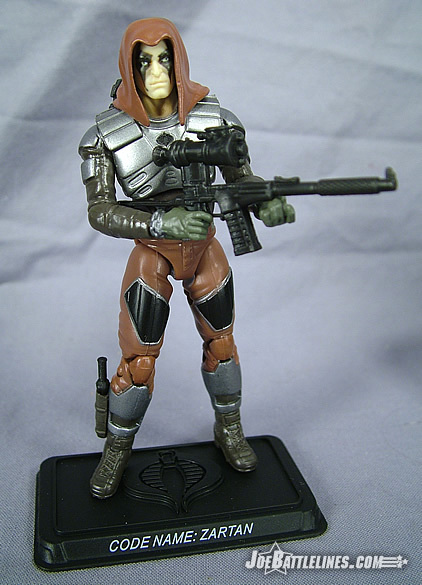 While the mask isn’t a perfect fit and shows a bit too much forehead when placed under the cowl, it works far better than the masks that were included with both the Spy Troops releases of Zartan and Agent Faces. I never used the mask much as a young Joe fan and yet I find myself putting it on the figure more often that I’d original intended. It’s a fun accessory and one that really shows just how much attention to detail Hasbro is paying in terms of recreating classic characters that fans love. When it comes to articulation, Zartan is one of the most poseable figures in the 25A line. 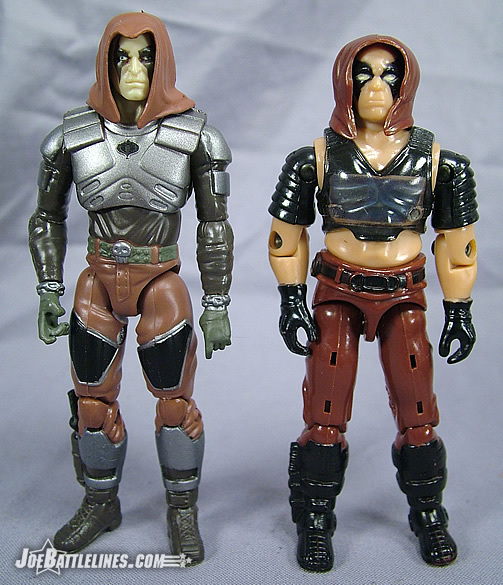 Whereas other figures have been saddled with v-crotches which limit the range of motion found in their legs, Zartan’s waist almost resembles those of the classic ARAH-era construction. As such, he can sit, stand, and even fit into vehicles as well as the standard o-ring construction Joe. 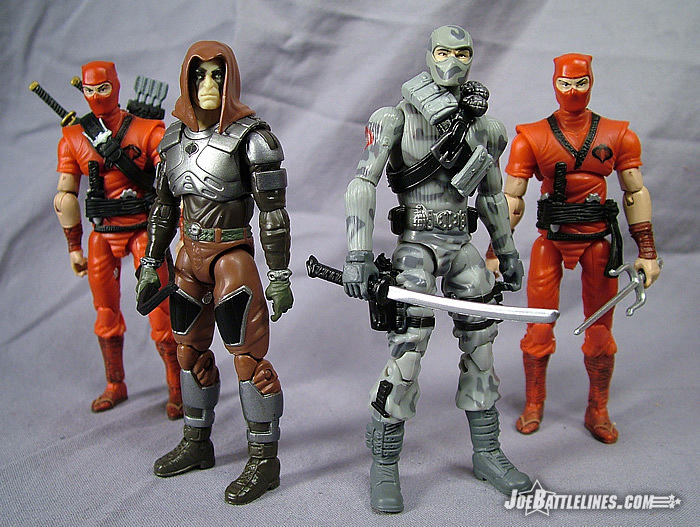 Add in the fact that he’s slightly shorter than many of the figures in this line (with Snake Eyes and Storm Shadow being the exceptions) and you’ve got a figure that could actually be used with all of the previous eras of ARAH-based Joes without standing out. 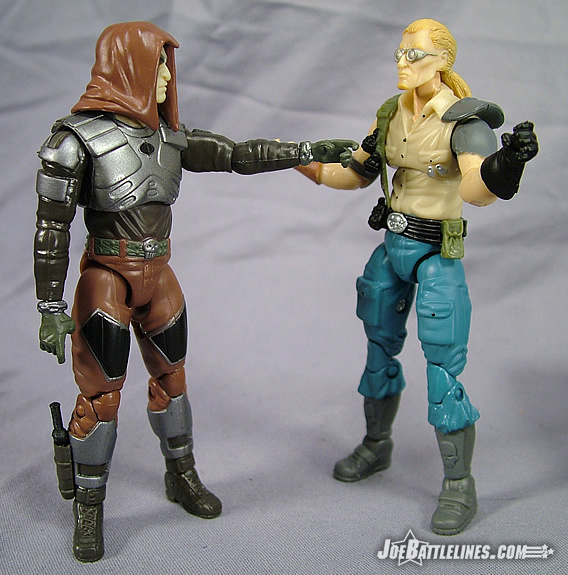 Zartan features a similar level of articulation to the Battle Pack Snake Eyes with the exception of the mid-torso joint which is located slightly lower on his chest. Aside from a pair of hands that seem a bit small for his size, I can find NO other faults with this figure’s construction or articulation. Hands down this is my favorite figure in this entire line. He’s detailed, stylish, and usefully articulated. He can fit into classic vehicles and doesn’t tower over the figures that came before him in the various GIJoe lines. (I’m not counting Sgt. Savage or Extreme.) He also represents just insanely fantastic this anniversary line can be when elements of design are properly thought-out and executed. 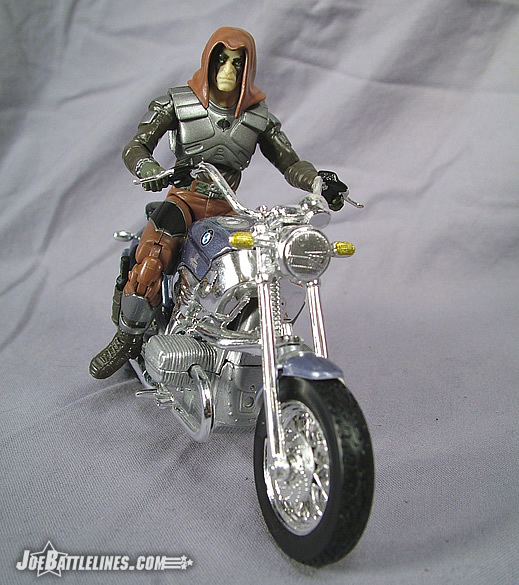 It is my sincere hope that Zartan is indicative of the figures that are yet to come in 2008 and not merely a convergence of “happy design accidents” that came together to produce a fantastic figure. I’ll even go so far as to say that, if you’re going to buy ONE figure from this entire line, this is the figure to purchase. Toss away the Spy Troops and Valor vs. Venom incarnations and add this figure to your GvC-era collection or place him in the midst of your budding 25A display. Either way, go out and snag this figure as he really is the “best of the best” of this line. Of course, that’s just my opinion.